For decades, new cars have meant more than simply a means of getting from here to there for millions of Americans. Perhaps it's the amount of money we spend on the purchase or the possibilities and freedoms that come with the purchase of a new vehicle, but cars often represent an idea that transcends mere transportation. As part of our 2017 POPSUGAR Insights Auto Report, we surveyed over 1,200 US millennial female in-market auto shoppers to better understand their perspective on shopping for their next vehicle. We learned that for millennial women, safety matters most, followed by a sense of freedom. 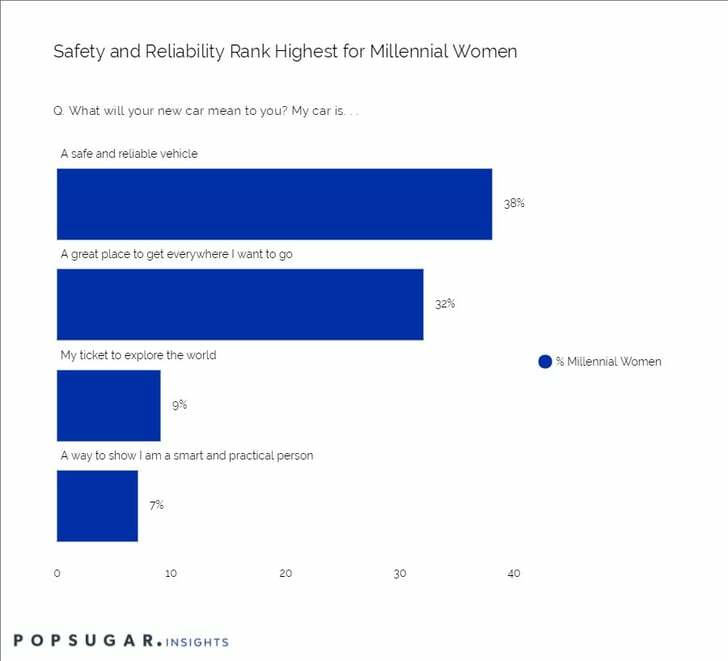 That's why 38% of millennial women say that, to them, their new vehicle will represent a "safe and reliable" vehicle, a "great way to get everywhere I want to go" (32%), their "ticket to explore the world" (9%), and a "way to show I am a smart and practical person" (7%).